A Symbol of the French Heritage of the St. John Valley! "What are these ployes?" ask visitors to the St. John Valley, when we recommend they eat them. The answers fall into two categories, depending which generation is responding...rambling and direct. The older generation gives a nostalgia-laced description of the taste, a litany of recipes and cooking techniques, childhood memories of the tall, steaming stacks of ployes on the supper table, and of Mémère's batter-stained cloth covering the sourdough (lavain) wooden bucket on the sink board. 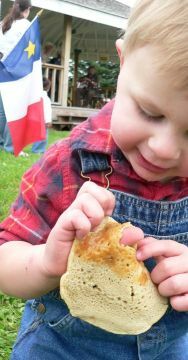 The younger generation comes directly to the point and describes the ploye as a yellow-green pancake, made with locally-grown buckwheat (bockouite) flour. A ploye is cooked on one side only, on a very hot skillet locally called a 'poëlonne'. Air holes form in the ploye as it cooks. When the top of the pancake is dry, it is ready to eat. Ployes are served rolled or folded as a substitute for bread, and make a good addition to any meal. For breakfast, serve ployes with cretons, a spicy pork meat spread. For the noon meal, serve with butter instead of bread and, after supper, serve with molasses or maple syrup, as a dessert. The origin of the word ploye, eludes us. Some sources claim that it comes from the word plier, meaning to bend or fold. Others say the word comes from the repetitive stirring of the batter, that sounds like...ploye-ploye-ploye. Buckwheat, a hardy plant, grows quickly in any type of soil...newly cleared land, established fields, wasteland, or the edge of the forest. Buckwheat requires a short growing season, usually ten to twelve weeks, making it a highly desirable crop for our ancestors, given the brief St. John Valley summer. Some say the word bockouite probably comes from the Dutch word 'biekweit' (beech wheat). A grain of buckwheat, does resemble a tiny beechnut. Obviously, if our ancestors had brought the plant with them from France, we would call it sarrasin or blé noir, like our relatives in Canada and France, instead of using the local colloquialism bockouite. Perhaps the word is simply a phonetic spelling of the down-river Anglo word, as pronounced by Acadian tongues. In France, a ploye is called 'galette de sarrasin'. Our Canadian cousins call them 'plogues au sarrasin' and flip them over once, while cooking a thinner version. However cooked and whatever called, the buckwheat ploye is not only nutritious and versatile, it is a treat for the taste buds! Mix all dry ingredients in a large bowl, with 1 1/2 cup of cold water, until the consistency of cake batter. Add 1/2 cup of hot (not boiling) water and mix well to make a light batter. Spoon enough batter onto a very hot griddle, to make a 4 to 8 inch pancake. Serve with creton...that's _another_ story, butter, or molasses! The Upper Saint John Valley on the Maine-New Brusnwick border, is home to New England's oldest Acadian community. This ancient Maliseet homeland was settled in the 1780's by French-speaking Acadians who had escaped deportation from Nova Scotia in 1755 by taking refuge in Canada's Lower St, Lawrence Valley. After the Treaty of Paris (1763) they migrated with their Canadian spouses to southern New Brunswick. When 12,000 Loyalists flooded into that region at the close of the American Revolution in 1783, the local Acadians, feeling again endangered, sought lands elsewhere in New Brunswick. Nineteen families landed in the Upper Saint John Valley around 1785 and were soon joined by their Canadian kin. Although their flourishing community was divided between Canada and the United States by the Webster-Ashburton Treaty of 1842 which made the St. John River an international boundary, the descendants of these intrepid pioneers have nonetheless sustained a rich, vibrant French heritage. My good friend Ken Theriault's son, Andre Tomah Theriault, enjoying his "ploye". August 2, 1996...It's 'Foire time' in Edmundston New Brunswick, and that means the region's famous PLOYES are flying off stovetops and into the mouths of hungry Madawaskans. The ploye...a crepe-like treat that is a staple here and nowhere else...is a tradition at "La Foyre Brayonne", the annual festival that turns Edmundston into a giant five-day party. And tomorrow, the secrets of les ployes will be revealed by a master-maker! You see, there are a number of tricks to making ployes. They are as unique and mysterious, as the Brayon (and the Acadians) people who live in this region. It is a deceptively simple recipe, that requires experience and precision. "There are still people who have trouble making them," says Robert Emond, known locally as a top ploye-maker. "that's why I'll reveal the secret on Saturday." Mr. Emond conducted a clinic of sort, at La Place de l'Artisan, one of the Foire venues along the Madawaska River. He described the recipe...which he has taken with him on ploye-making visits to Quebec and France...as well as the all-important method of cooking. As Mr. Emond spoke yesterday (August 1, 1996), hundreds of people crowded around La Place de l'Artisan, gobbling up ployes made by La Sucrerie Jalbert, a local sugar bush. The secret to a good ploye is making the mix in advance and giving it some time to work," said Therese Jalbert, as she poured it rapidly into a hot griddle. With a quick sizzle, the gobs of goo were transformed into golden, hole-marked ployes, slung into wrappers and sold for $1. each. "It's not hard to make," Mrs. Jalbert said. "You can buy our buckwheat flour in the store and the recipe's on it." The ploye is different from a crepe or pancake, because there is no milk or egg involved. The (Brayons and Acadians) people who settled in this area weren't rich and they needed a food that easy to make, cheap and nutritious. The ploye was born and handed down through the generations. Mr. Emond's recipe which he shared with those attending the 1996 Foire, came from his mother-in-law. It takes two parts buckwheat flour to one part regular flour, plus salt, water and baking powder. The flour and salt are mixed first with cold water. Then he adds boiling water, then the baking powder. He mixes and lets it sit for half-hour. "The ingredients need time to work," he said, "especially the baking powder. That's what gives us the 'eyes' of the ploye". The 'eyes' are large bubbly holes, another characteristic that distinguishes the ploye. Another difference is that the ploye is only cooked on one side. "If we turn them, they'll stick and we won't have the same good 'eyes'," said Mrs. Jalbert. Mr. Emond gained his local fame during the first Foire Brayonne 17 years ago, when, just a week before the festival, he asked organizers if the ploye would be a component of the event. That first year, he helped organize the "largest ploye" contest, and ever since, the food has been central to the festival, as a symbol of Brayon culture. One year, La Foire Brayonne featured a competition to see who could eat the most ployes. Mr. Emond is no longer the Foire's chief ploye-maker...that role now belongs to the Jalbert family...but his skill is still a valuable ticket. Earlier this year (1996), the municipal employee joined a delegation from Edmundston on a visit to Bressuire France, where he made ployes that impressed the culinary-choosy Francais. This year (1996), because so many people asked him how, Mr. Emond decided to provide lessons. A couple of other last-minute pointers: "First'" he said, "don't try this at home." Mr. Emond explained that the buckwheat flour from the Edmundston area, is refined in such a way to lend itself to making ployes. People trying it elsewhere, may get less-than-satisfying results. And real ploye-makers don't grease their griddles with oil or fat. So how do you keep them from sticking? "That," he says with a twinkle in his eye, "is the secret of the ploye!" On an annual basis, my wife Judy and I return to Grand Falls, New Brunswick (36 miles from Edmundston) to visit relatives. We always come home with 5 or 10 pounds of the 'local buckwheat flour', produced by her cousin, Paul Daigle of St. Leonard...half-way between Edmundston and Grand falls. With the exception that Judy does not add salt (in consideration of my cardiac condition), baking them on _both_ sides and adding a "tad of vinegar", her recipe is identical to Mr. Emond's. When asked "why the tad of vinegar", Judy quickly replied, "because your mother always did that!" And, Judy insists it's spelled...plogue! The above noted is a re-print (with thanks) of newspaper article entitled "Cunning Ploye" which appeared in the August 2, 1996 New Brunswick Telegraph-Journal. Click to visit: The Bouchard Family Farm for more information! 1) Place all above-noted ingredients in a deep pot. 2) After meat starts to cook, allow to simmer on medium-low heat for about 2 1/2 to 3 hours. Stir occasionally. 3) Remove from stove and allow to cool for at least five minutes. 4) Mix thoroughly using a hand mixer, for at least one minute. 5) Place in small containers and refrigerate. 7) Once cooled in refrigerator, the "cretons" may be frozen for future use. Do not freeze longer than a couple of month. But... there's nothing like "fresh cretons"... spread on ployes, of course!